Other Products by Herbs Of Gold. Search other Digestive Health products. Herbs of Gold Probiotic 55 Billion is a super-potent probiotic providing 55 billion live cultures in every single capsule. This product is commonly used to assist with a variety of gastrointestinal complaints, such as regurgitation, gas-induced abdominal pain, nausea, gurgling, constipation, irregular bowels and flatulence. Herbs of Gold Probiotic 55 Billion supports healthy digestive function via improving the composition of the intestinal bacteria with multiple strains of bacteria. 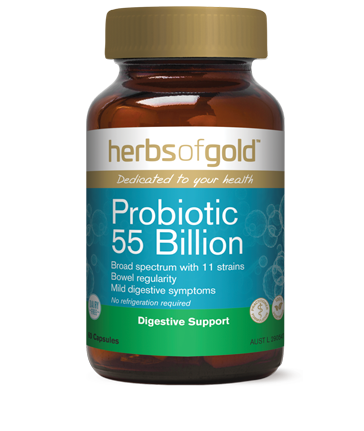 Herbs of Gold Probiotic 55 Billion is a high strength broad spectrum combination of 11 different probiotics sourced from scientifically studied danisco strains to help maintain balanced intestinal flora and healthy digestive function. Herbs of Gold Probiotic 55 Billion supports not only the health of the digestive system, but also the immune system1. This is believed to be due to the probiotics ability to boost the gut mucosal system by increasing IgA cells and cytokine-producing cells of the intestine2. This makes Herbs of Gold Probiotic 55 Billion a versatile product. Herbs of Gold Probiotic 55 Billion contains room stable probiotic strains to establish friendly intestinal flora, support the immune system and boost general health and vitality.